This past weekend, Scott Speed's 95 Ford Fusion featured an interesting paint scheme in Las Vegas. 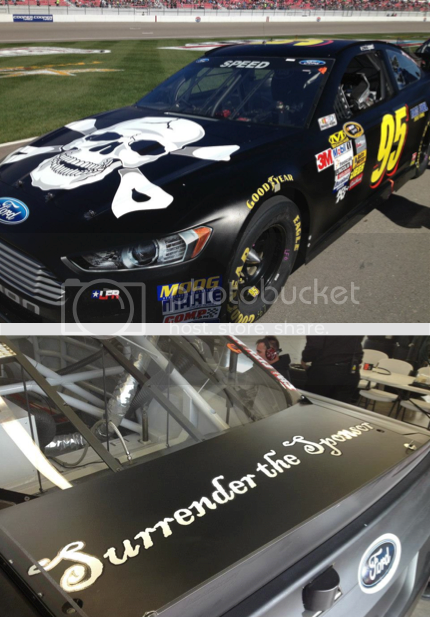 Across the back of the race car were the words: “Surrender the Sponsor" accompanied by a full black skull and cross bones. The paint scheme, intended to help the team generate interest from sponsors, has already worked with the team closing a couple of deals for future races, according to USA Today. The 95 Ford Fusion is no stranger to publicity this season. In February, Speed's last sponsor, DISH, used the LFR sponsorship at Daytona to promote its ad skipping technology, which Nascar TV partner, Fox is currently suing DISH over. Since that time, Speed has been without a main sponsor.